OVERNIGHT PARKING PASS REQUIRED IN NORTH LOT TO ALL GUESTS. Ask for one at Fuel Dock or Marina Office. On Memorial Weekend, Fourth of July, and Labor Day all boats will be charged $1.00 per foot. 1. Charge for electricity is $3.00 per 24 hour period. 2. Failure to pay guest moorage fees in advance will result in a $25.00 late fee. 3. Vessels with “For Sale” signs will be charged an additional $3.00 per 24 hour period. 4. Moorage fees will take effect after stays of 4 hours or longer. 5. Moorage fees accepted at fuel dock. 6. After-hours payment may be made with check or cash in an envelope provided at the fuel dock. 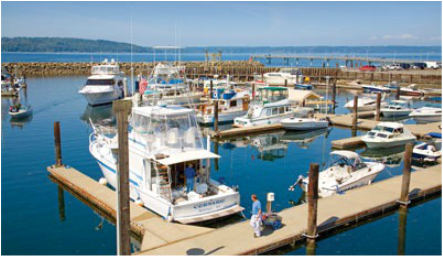 We accept reservations in our guest moorage area for vessels 32 feet or larger. Reservations are guaranteed when paid for at a minimum 1 day in advance. To reserve guest moorage you must call 206-824-5700 during office hours. We do not take reservations for single boaters over holiday weekends (i.e. Memorial Day, 4th of July, Labor Day). Other blackout dates apply. Guest moorage is non-refundable. Group reservations are available for 5 or more boats spending the night and purchasing guest moorage. CLICK HERE for more information regarding group reservations. Failure to pay in advance for guest moorage may result in a $25.00 late fee in addition to moorage fees due.